Chris Evans, star of the upcoming "Captain America" sequel, made an appearance on the National Mall Tuesday, shooting scenes for the upcoming movie with co-stars Scarlett Johansson and Anthony Mackie. The production underway in D.C. Tuesday is officially known only as "Freezer Burn." But that working title is associated with "Captain America: The Winter Soldier," the sequel to the 2011 blockbuster that starred Evans, took in an estimated $140 million and was a key part of the series that led to "Avengers" in 2012. Evans was seen in sweatpants and a grey T-shirt, laughing with makeup staff and briefly doing push-ups and jumping jacks. The sequel to "Captain America" is shooting on the National Mall. News4's Megan McGrath reports. The production has put up tents and trailers close to the mall. At about 7 a.m., 4th Street between Jefferson and Madison streets was closed. But the closures will move through the area and could affect traffic until 10 p.m. tonight, reports News4's Megan McGrath. The actual shooting site is expected to move around throughout the day, but several roads are closed and parking is limited. More closures are expected Thursday, according to a release from the Metropolitan Police Department. Hillyer Place NW (between Connecticut Avenue and 21st Street) and 20th Street NW (between Connecticut Avenue and Q Street) will be closed Thursday from 7 p.m. to midnight. RAW VIDEO: Chris Evans Shoots in Washington, D.C.
Chris Evans shoots "Captain America: The Winter Soldier" in Washington, D.C.
Maryland Avenue SW will be closed from Independence Avenue to 6th Street until midnight Thursday. The closures, however, aren't likely to keep curious fans away. In fact, signs near the production warn that anyone in the area may be photographed in the background of the movie -- and that they won't get paid for it, reported McGrath. The District seems to have a role itself in "Winter Soldier." Earlier this month, the production closed the Roosevelt Bridge briefly for shooting. 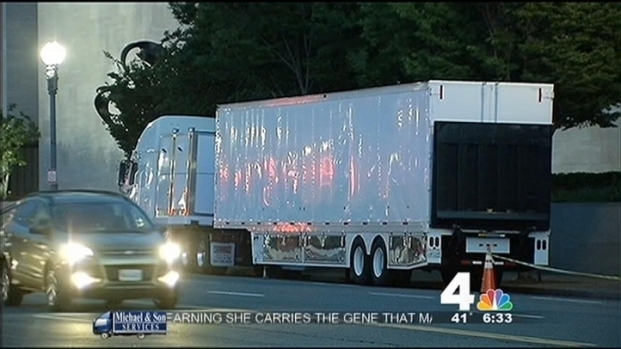 A movie shoot - possibly the upcoming Captain America sequel - has shut down some D.C. streets. News4's Megan McGrath reports. District film officials have said the bridge plays an "integral role" in the new movie. "Captain America: The Winter Soldier" will star Evans, Johansson, Samuel L. Jackson and Robert Redford, and is expected to be released in 2014.